We are happy to have a fair number of horses find loving homes over the years. Below are just some of our more recent sales (2002 - 2008). The internet has been an incredible tool, with quite a few of our horses selling due to advertising on the web and on this site. If you wish to contact any of the owners of "our" horses, please let us know and we can put you in touch. 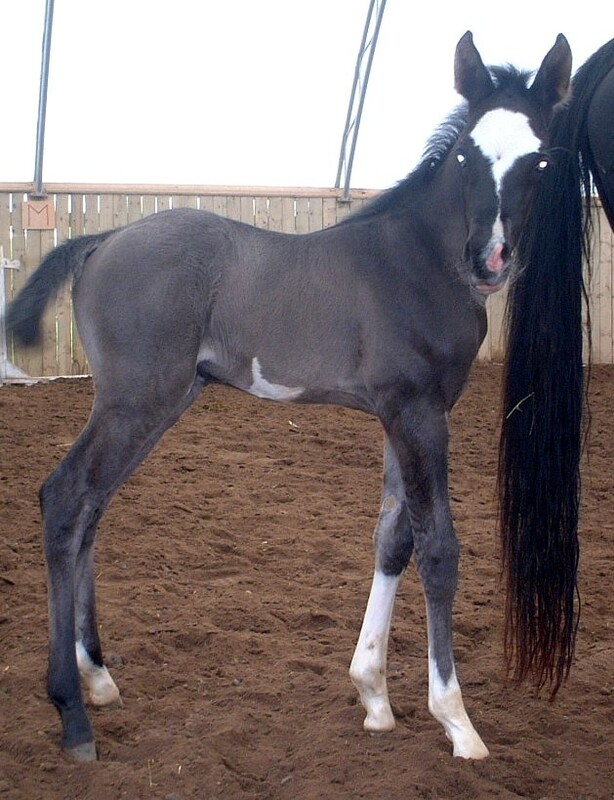 Already a show Champion, he is the 2005 Eastern Canadian Breeder's Champion Colt. Seneca is flashy with his long neck and legs with 3 white socks. He will finish up around 15.2 hands or more. Sweet natured, easy to work with, he was a real pleasure to take to the shows. 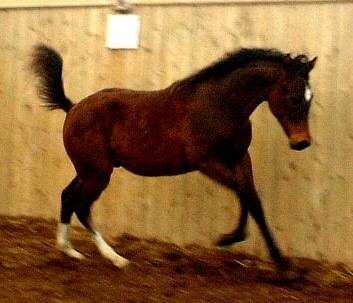 Seneca will likely be a Country English pleasure mount or a National quality Hunter. 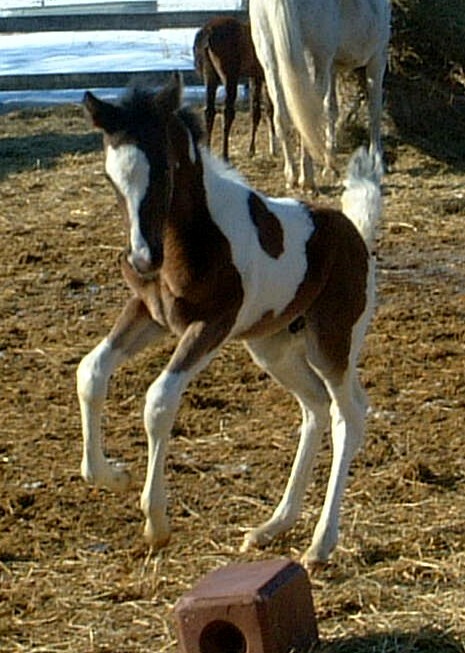 He will definitely make an impression in the halter ring before starting his performance career. Also with his breeding, size, bone and stride, he would make an excellent endurance mount for a heavy weight rider in endurance, he has a lot of the same qualities as Parker, but big and black! 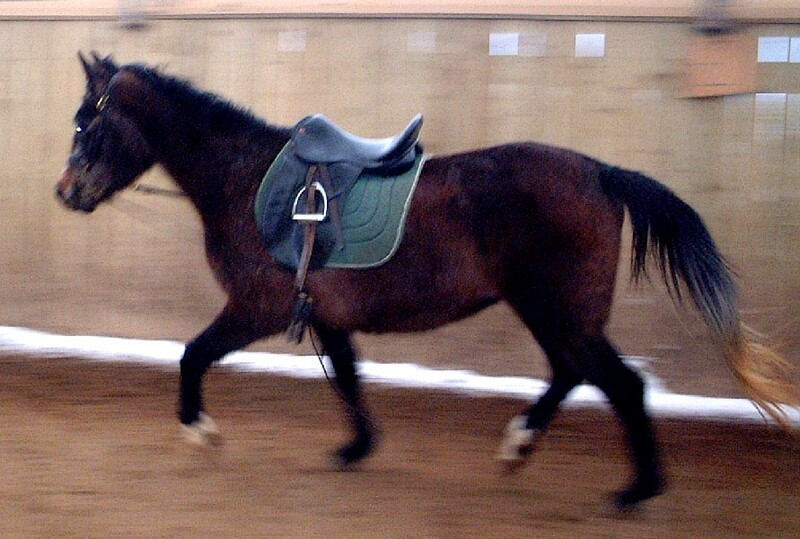 Easily started under saddle Fall 2007, great walk, smooth trot. Congratulations to Sarah Robinson of Ottawa. Summer 2007 - 15.1 and bum high! This mare out does herself with whatever stallion she is crossed with. Willow might just be her best yet, upright, flashy and incredible movement. 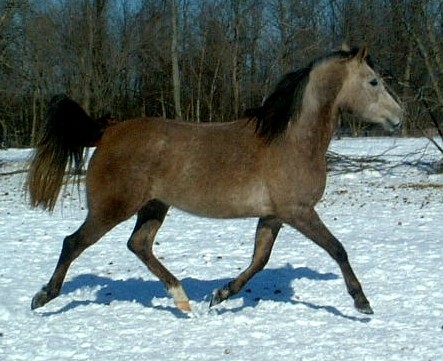 He is very pretty and looks like he will make a fantastic hunter or western pleasure horse. 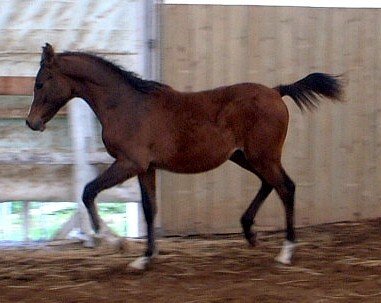 This will be a top sweepstakes halter gelding and then excel in performance. His maternal half brother, Aaristocrat is a Regional Champion in Endurance as well as another maternal brother, Shucks is a FEI Endurance Team member in Germany. 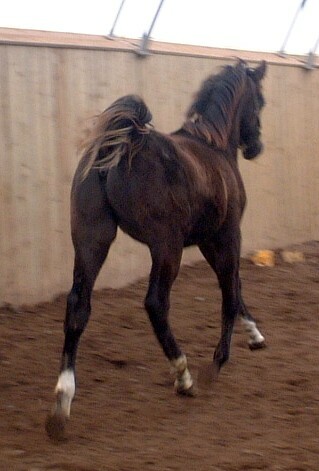 Deeble is growing up beautifully, tall, correct and another great mover. Exceptional competitor in the HA or Pinto show ring. 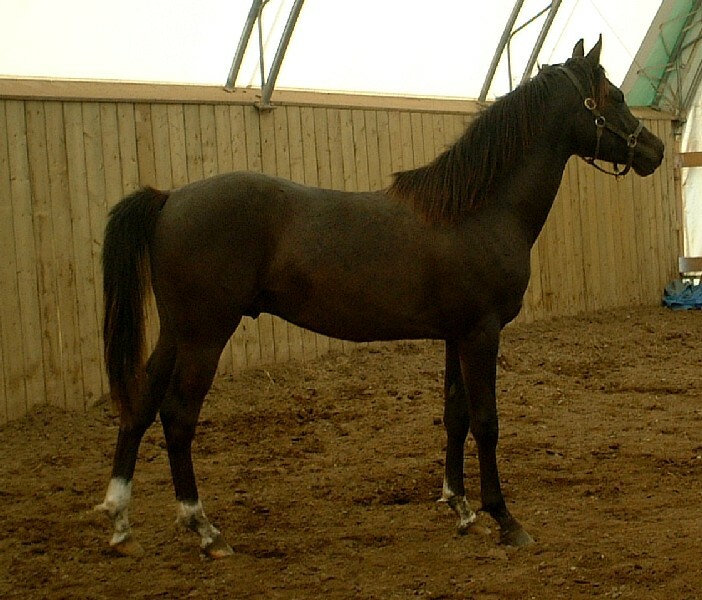 Czeslaw (Chess-laff), is a bold and intriguing yearling colt. He exemplifies everything his pedigree says he should and catches your imagination. 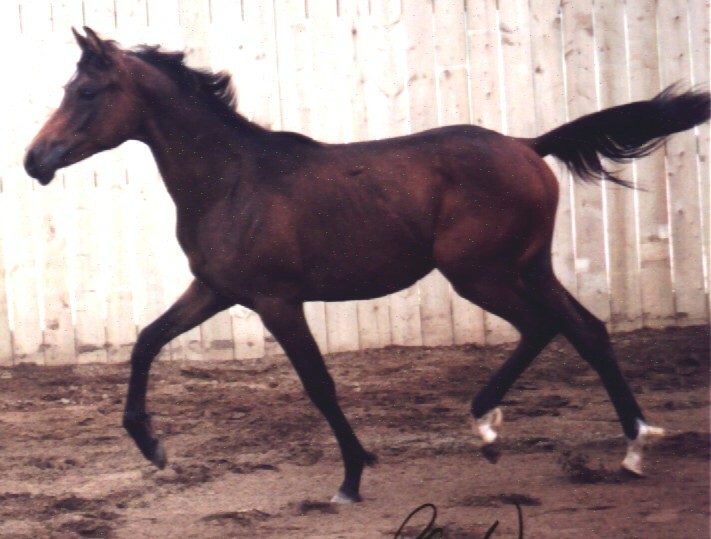 He is by Wojslaw, who is also the sire of Triple Crown winner, *Emanor in both Stallion halter and English Pleasure. 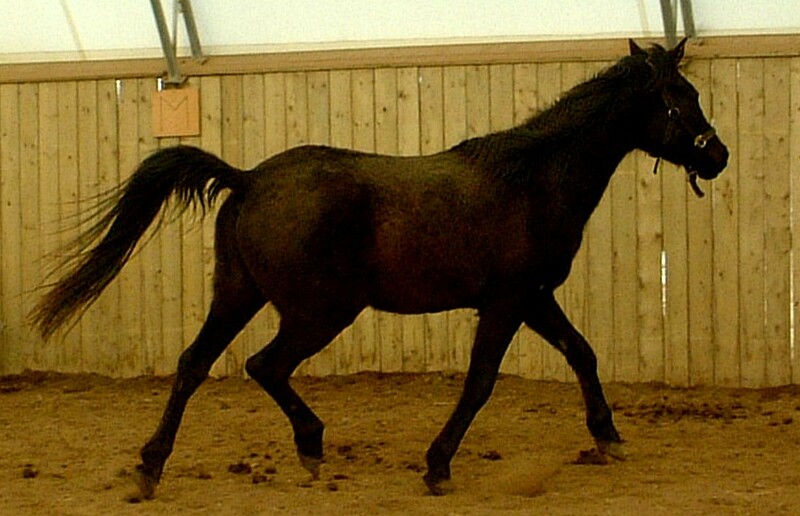 Wojslaw him self was named Polish National Champion Stallion, All Scandinavian Reserve Champion Stallion and is a leading racehorse Sire in Poland. He has been imported into the US by Marsh Parkinson. 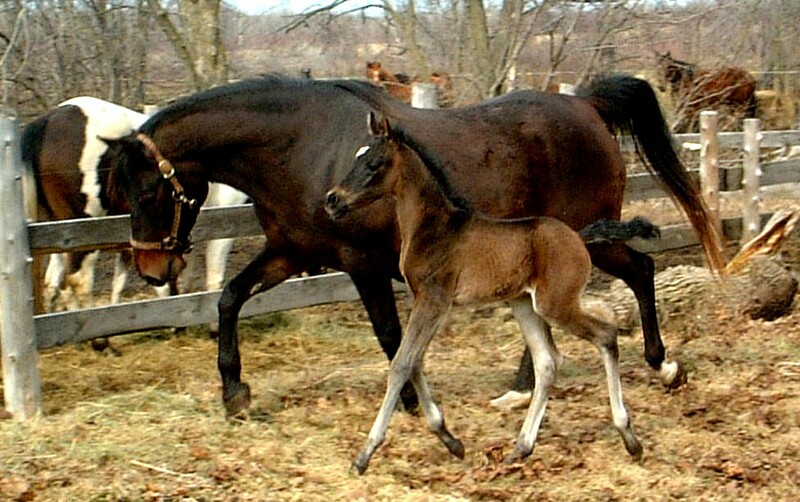 His dam is by Polish and World National Champion, *Gondolier out of the Gwarny daughter, *Czarnuska. 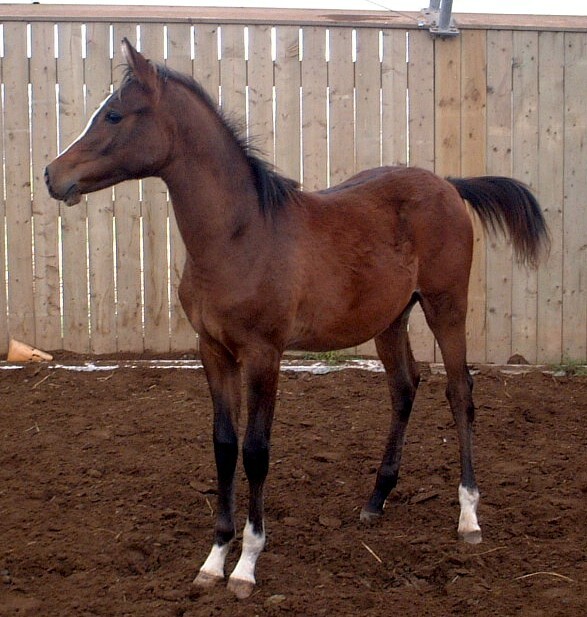 Tomaz of Magness wrote: "Czeslaw is a special colt as he is out of Czelsas Pony. This is a very good line in Polish breeding. 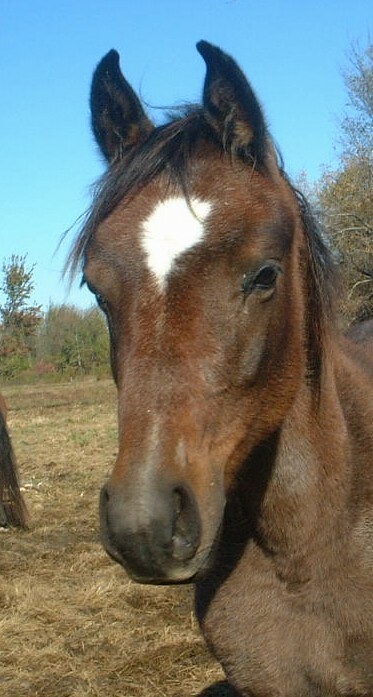 Czelsas Pony is a beautiful mare with pretty head, big eys and nice dished face. She is bay and her full sister Czarmane is very fleabitten gray! 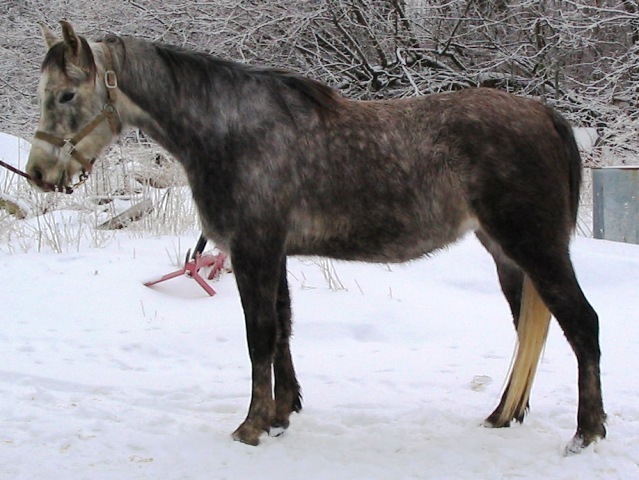 The mather Czarnuszka is by Gwarny one of two Amurath Sahib sons in Polish breeding. 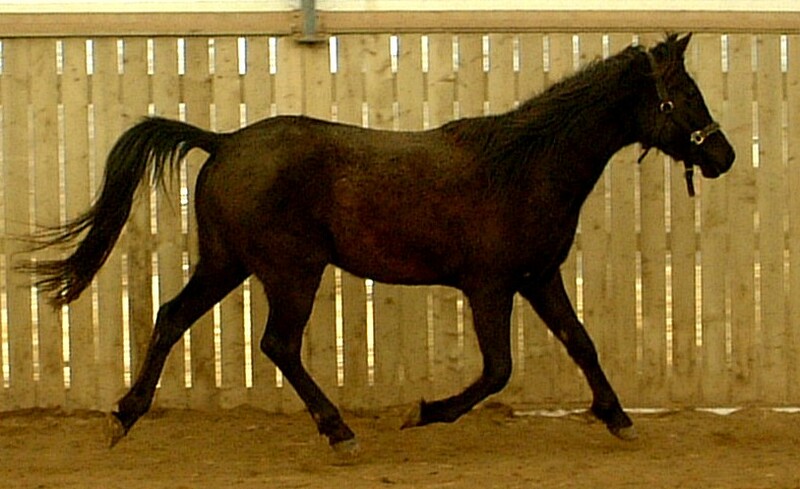 Amurath Sahib was a stallion who sired only very few mares, like 5 or 6. and every one got to be a superior producer. 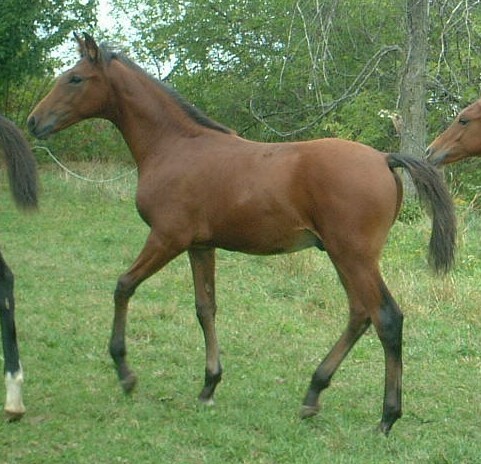 One of them, Balalajka was a dam of Bandola and Bask.Czarnuszka was imported by us from Poland, as well as her dam Czapelka out of Czrowna by Comet. This is very strong and good linie. 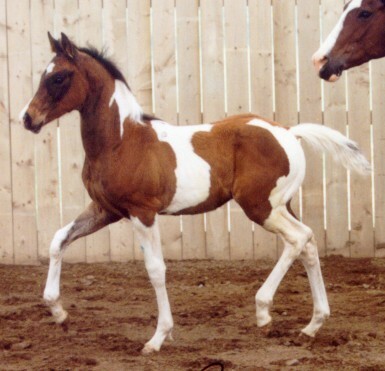 The only think they are little small, but Arabians should be great, not big, in my mind." Prozak's dam line has the great Polish horses Celebes, Czort, Pohaniec and Dardir in it as well as the great mares Posanna, Pemba and Canaria. 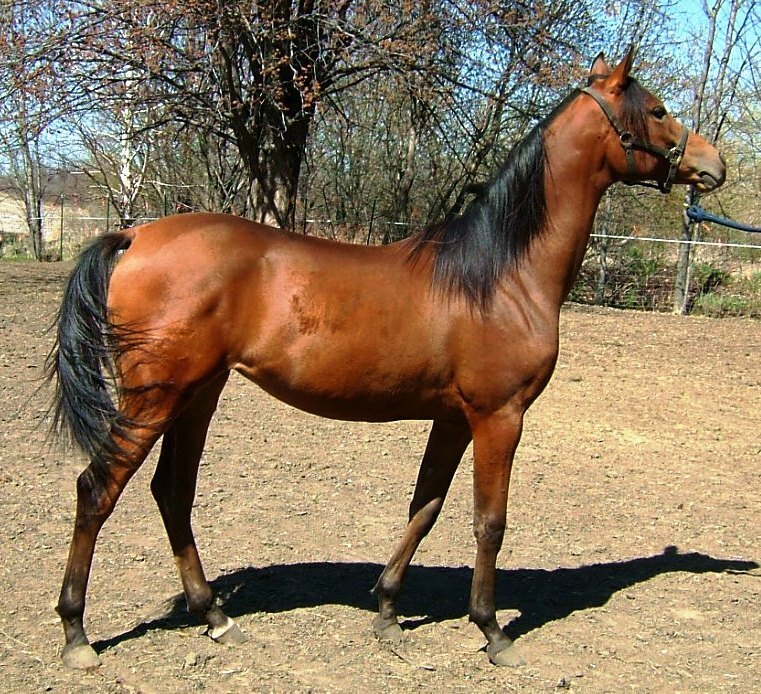 Prozak is another solid Kuhailan type stallion and should excel in racing, endurance or as a hunter pleasure horse in the show ring. 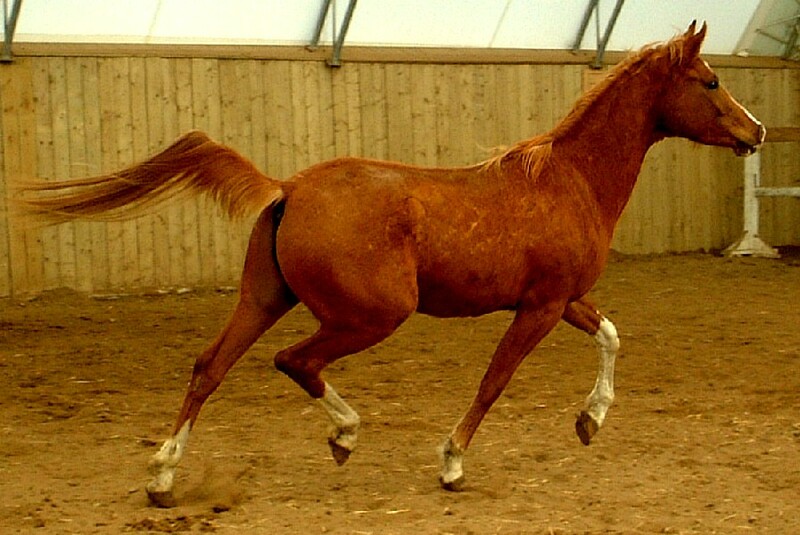 He has an amazing trot, great suspension, length of stride and overtrack. Has been long lined, trailered extensively, bathed, clipped and ties well. 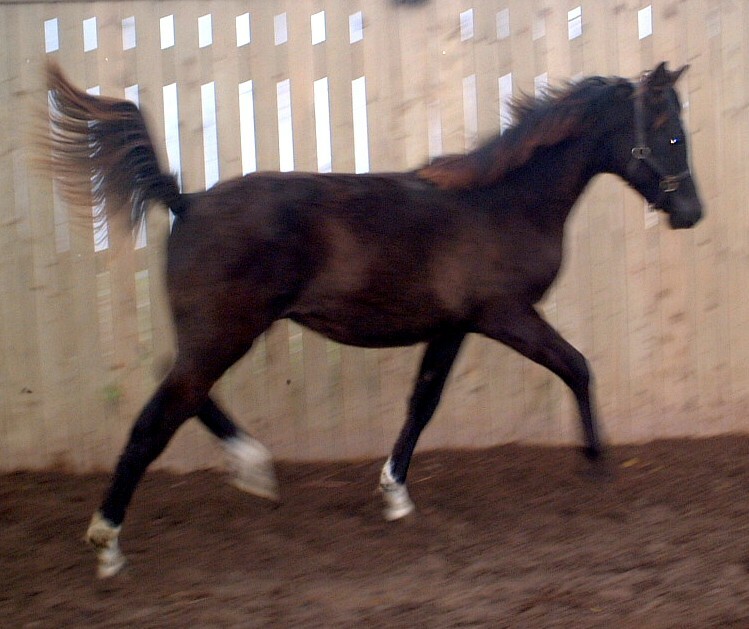 A maternal sister to Premavera, this filly has loads of potential in the show ring and as a breeding animal. 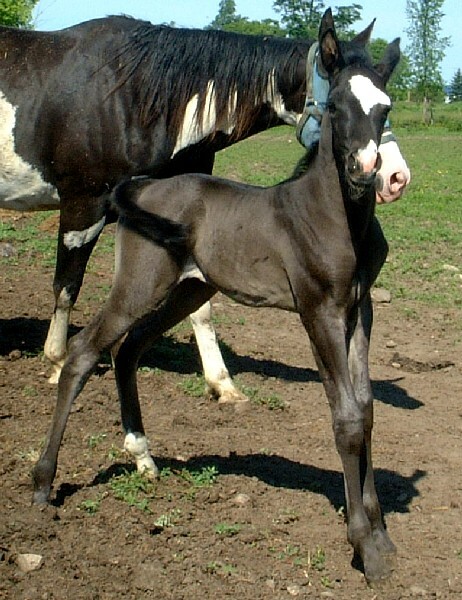 Her sire is by the multi division National winner, Concensus++++/ and a Champion Halter horse himself. 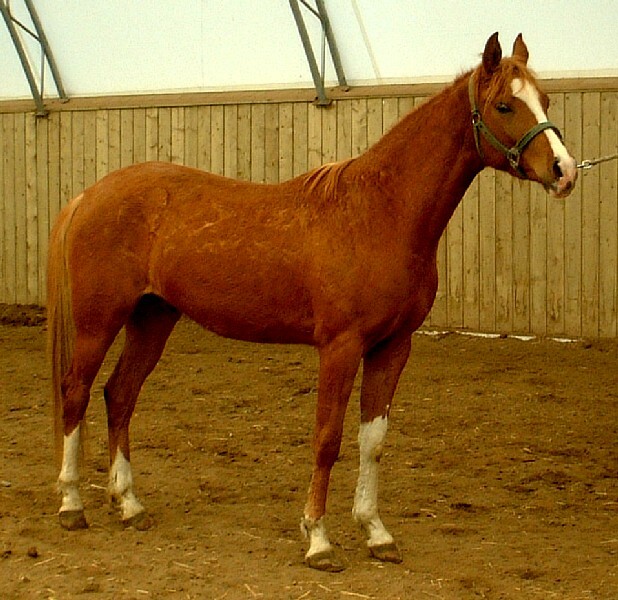 She was shown lightly as a yearling and won the Sport Horse In Hand Mare class at the Empire Spring Show and the Tulip Arabian Horse Show. Very flashy and a good mover, she should prove a lot of fun. Congratulations to Miguel & Nora Burnier! 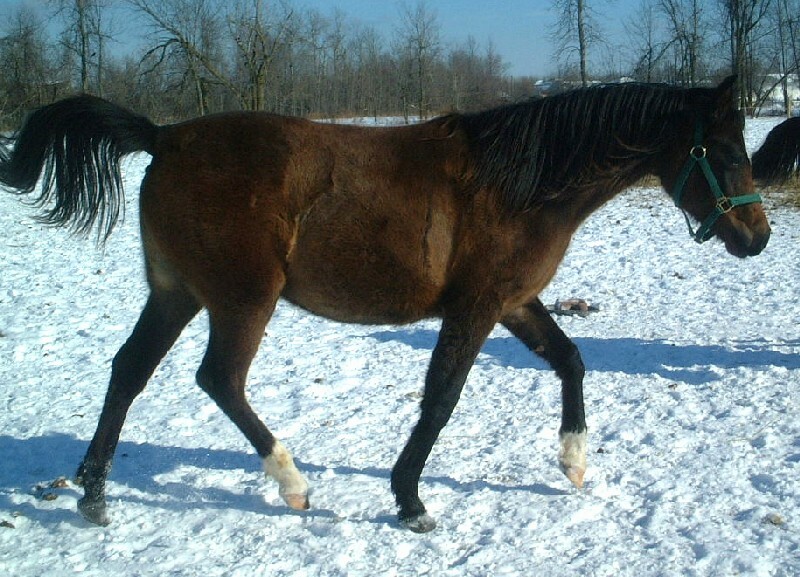 Rose is a full sister to the above Primmrose and is out of the *Gondolier daughter, Premavera and her dam is by the Leading Living Sire, *Aladdinn. 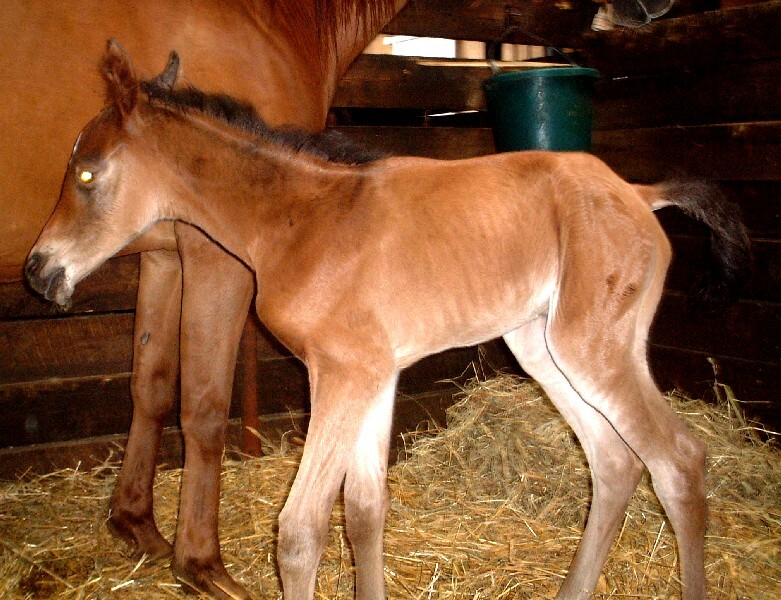 Another lovely filly for halter, performance and breeding. 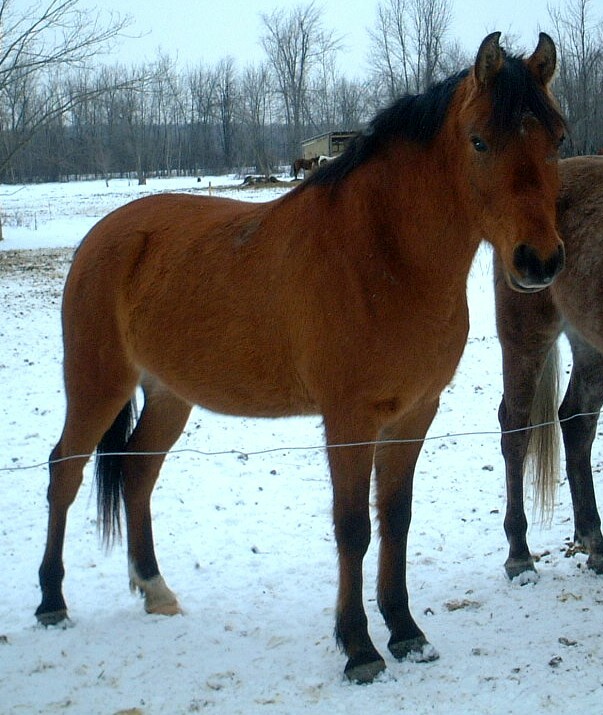 Stella is a very pretty mare with a lovely body with loads of substance. 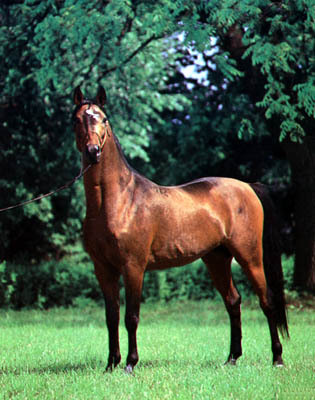 Her sire is a Driving, CEP and Halter winning son of Bey Shah out of the *Bask daughter Baskeena. 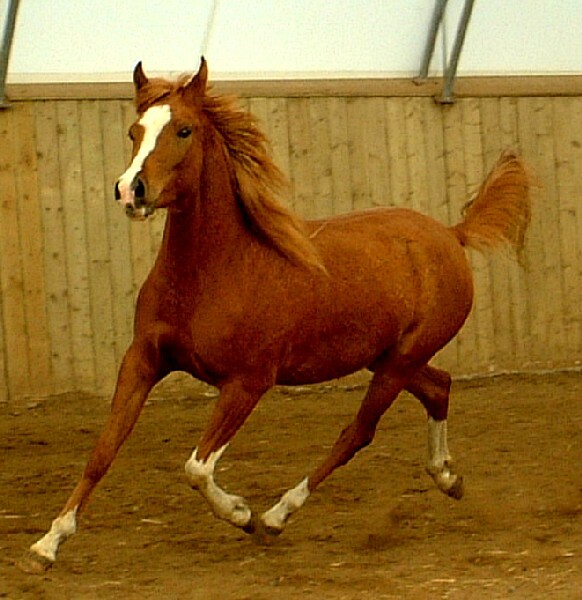 He is the sire of Multi Regional Champion Hunter Pleasure horse SM Tonka. Her dam is by the incredible *Serafix son SX Saladin, a top producer of performance horses and out of the Crabbet bred mare Apollonia. Stella has had professional training, but has been off the last year or so just being a horse as her owner was busy with other things. 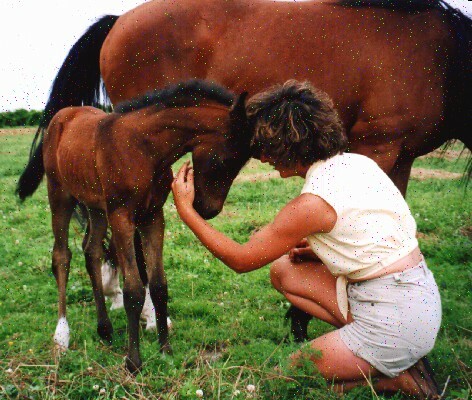 She has had one lovely filly in 2002. Stella is back in training until she is sold and is settling in to the work. 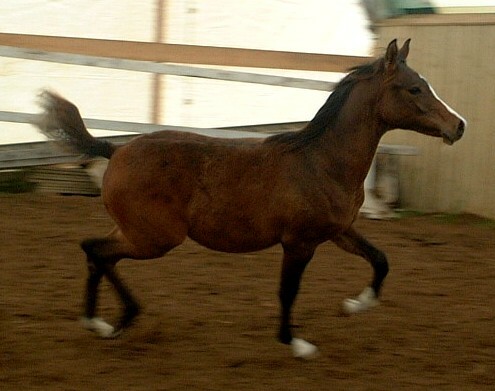 Nice flowing strides, she will make an excellent hunter or dressage horse. At the moment, Stella is being used in the lesson program with all ages and levels of riders. $5000 - OBO - sells with a breeding to one of our stallions. world wide since 1997. 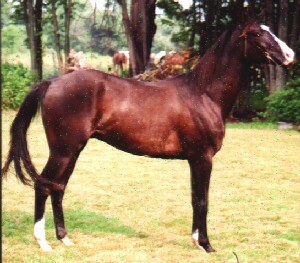 His dam is by World and Polish National Champion, *Gondolier. 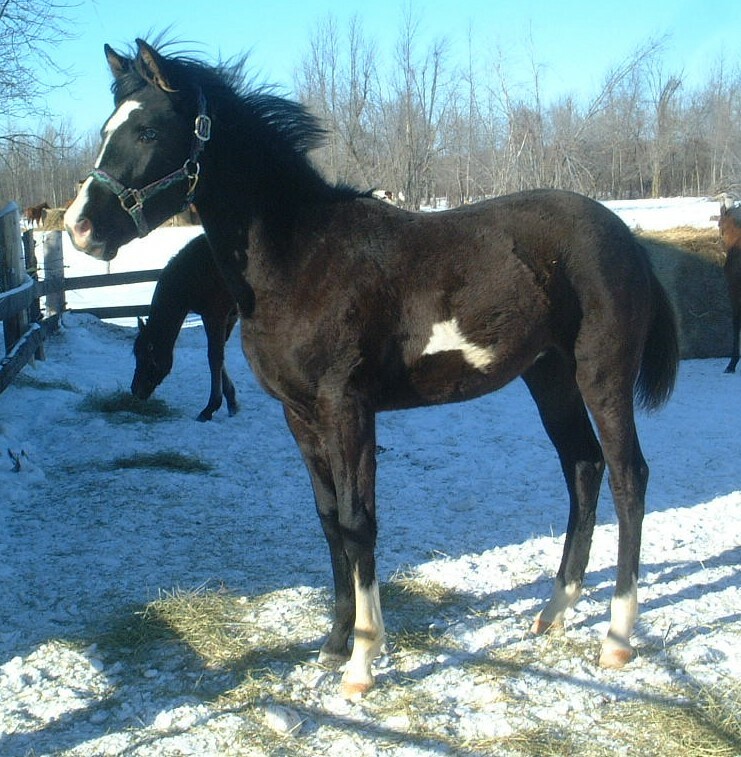 His sire, Sylekt was only shown once as a yearling as was named Region 3 Reserve Champion Yearling colt out of a class of 25. He is now residing at Colorodo State University being used in their frozen embryo program. Antenat is a bold mover with a big expressive eye and smooth body. 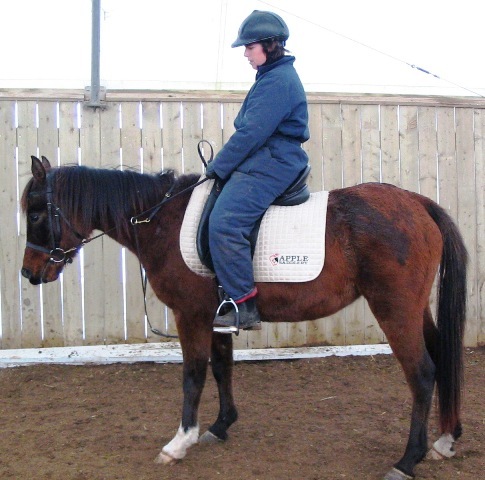 He has started some ground work with tack and is ready to continue saddle training. He looks like he will make a great western pleasure horse. 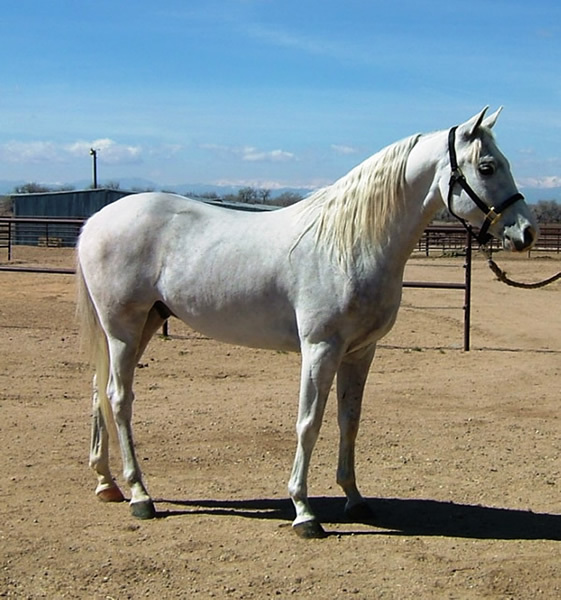 From Magness Arabians, this pure Polish gelding is everything his illustrious pedigree says he should be. Strong, proud, great legs, lots of substance and a big stride, he is also a real sweet heart. Green broke in Colorado before coming to Canada, he will continue his training at AES until sold. 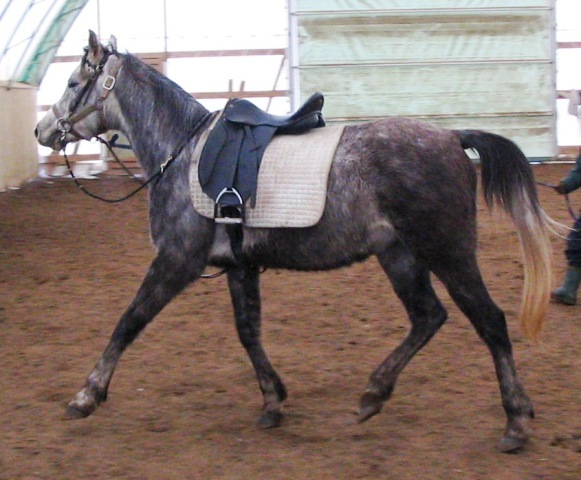 Gunsmoke will make a top Hunter or Western Pleasure mount as well as a distance riding horse. After only 10 days of work, Gunsmoke has joined the lesson program and is fast becoming a favorite mount! 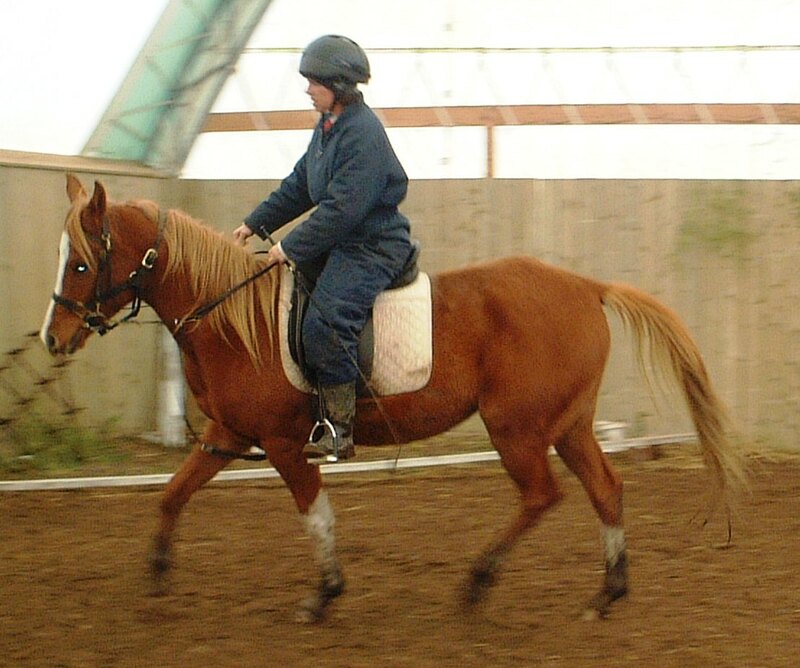 He is very smooth, rounds up effortlessly and is easy to ride. 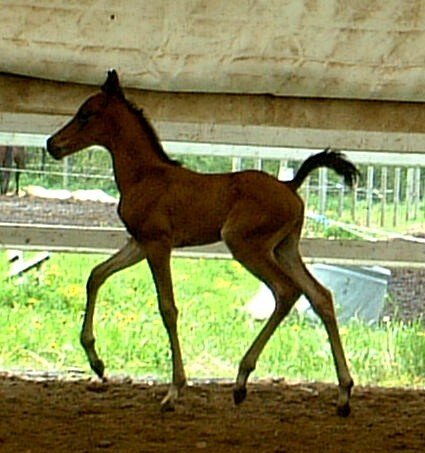 Resting pulse is 32/33 and fantastic pulse at every gait. Excellent recoveries and very very smooth and forward. 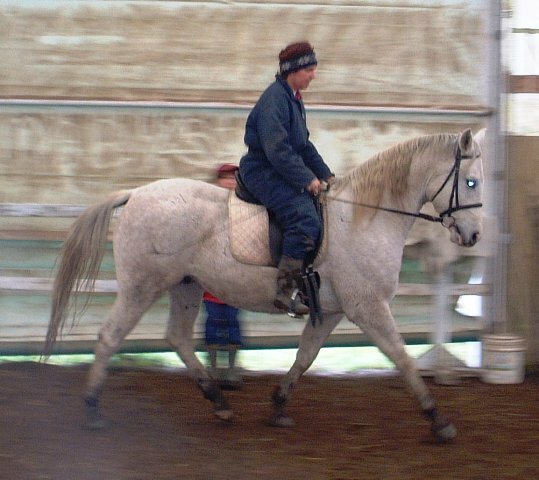 Gunsmoke will be shown at Empire Spring Show May 2006 and his first CTR will be at the OCTRA Spring Rides. At the Empire Spring Show in early May, Gunsmoke won his dressage class and consistently improved in large classes of 18 - 19 horses, until he placed 5th. He took everything in stride, tried extremely hard to please and was a joy to have at the show. Very suitable for a Youth or Amateur. He continued showing at the Tulip Arabian Show and Jubilee, winning JTR classes as well as placing extremely well in those large hunter classes (Open and Junior Horse). Show record is available. 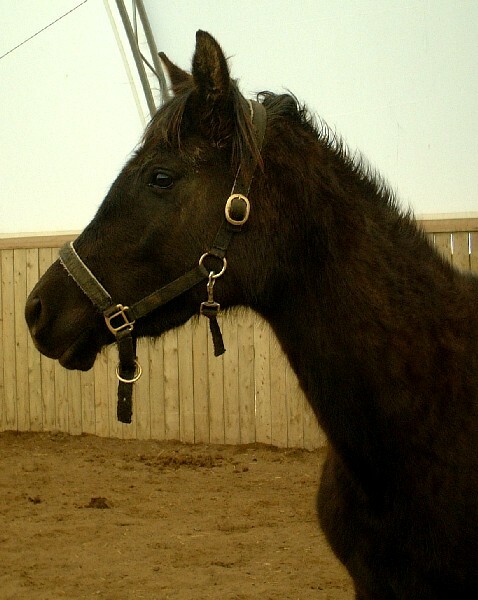 Captain is by the last *Bandos son who was out of the incredible mare Fantastka by Palas. 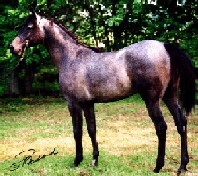 His dam is by the Partner son, Fantastyk and out of the *Druch daughter, Elegantkeh. Bred to move, he has a great big stride, correct conformation, attractive head, kind eyes and great balance. He will make the ultimate performance and family horse. Now started under saddle! (Feb 07) Price will go up as training progresses. Looking forward to seeing you out on the trails! 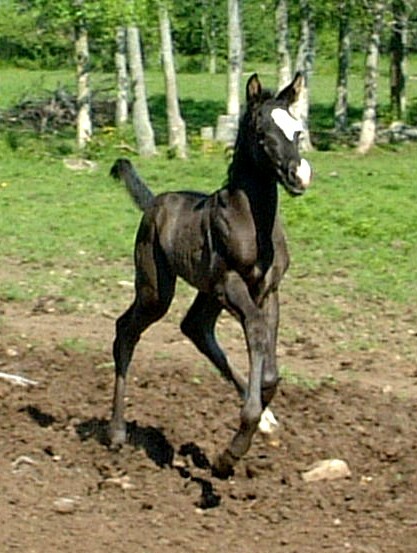 Czarming Gallant is bred to be a racing superstar. 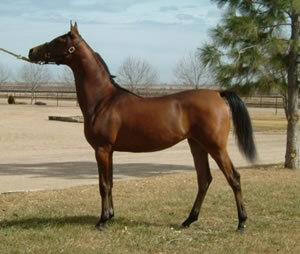 His sire is a winning horse on the track as well as US National Top 10 Halter horse. AH Gallant's dam is by none other than leading living sire, Aladdinn. His dam line has other racing greats such as *Gondolier, Gwarny and Magnat. AH Gallant is also the sire of many National and Regional winners in Western Pleasure, Trail, Hunter Pleasure and Endurance. Gallant looks and pedigree will take him far as well as his movement and calm disposition. Congratulations to Kim MacKeen of NS! A full sibling to Bee's Mighty Thor, a fantastic 3 year old with loads of English potential, Styx is a very typy, tall bay with a blaze and socks. He is a stunning mover with lots of charisma. 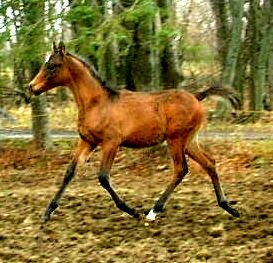 Definitely a Sweepstakes gelding halter prospect before he starts his performance career. He will finish 15.2 or better hands. 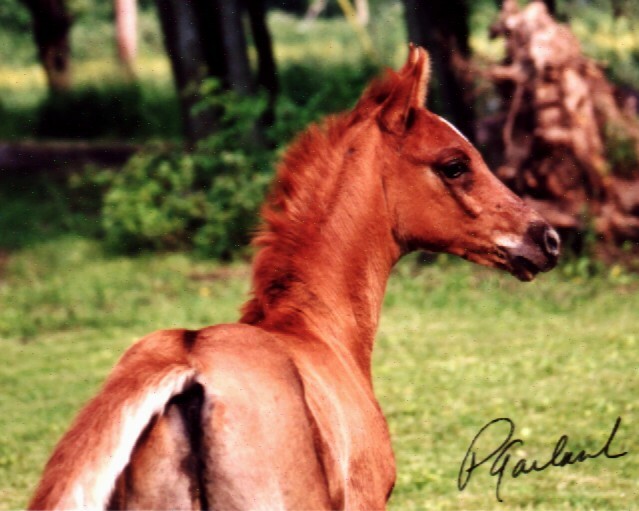 Shown twice as a yearling in halter and Sport Horse In Hand, he won both his classes at the Tulip Arabian Horse show against some very nice geldings and received a 78% on his Sport Horse score. 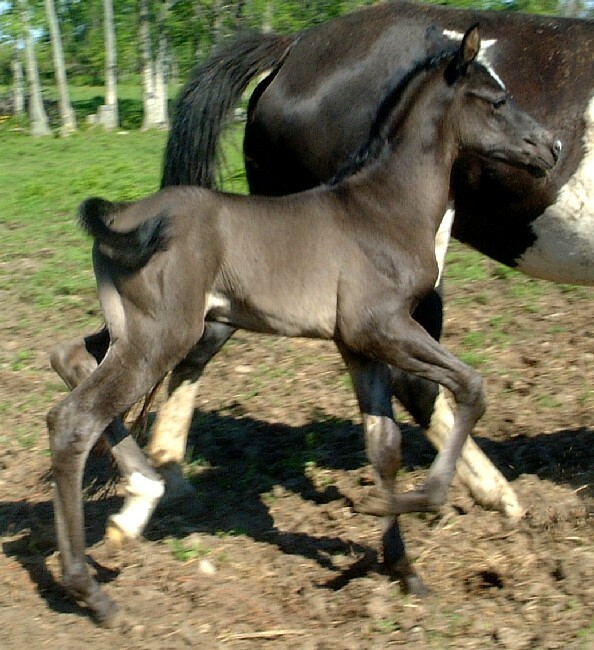 Tobi is an exceptional foal, like Rose's other boys and is stallion material. 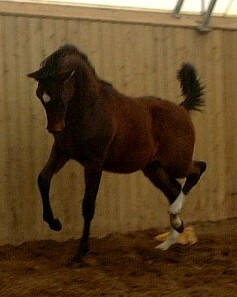 Very upright and those ever so long legs, he shows off the quality of his pedigree with incredible movement and style. As a yearling he has only improved and will continue to do so. Simply stunning as a two year old, he is maturing beautifully and showing loads of potential as a halter and performance horse. Nov '05 - muddy socks and all about his 4th time under saddle. 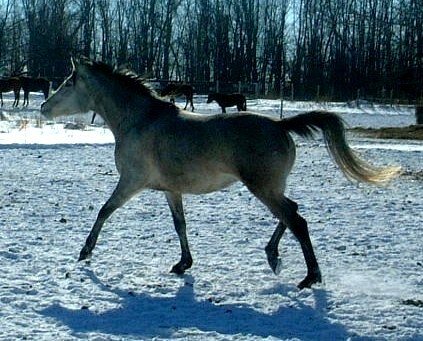 Zane is a flashy, charismatic young horse. He has 4 socks and a smart blaze with a lighter mane and tail. He has shown halter at local shows and done exceptionally well. He trailers, clips, baths and ties with good manners. 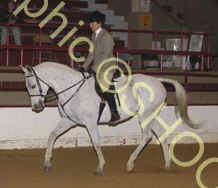 A beautiful mover, he is a Saddle Seat and/or Show Hack prospect. 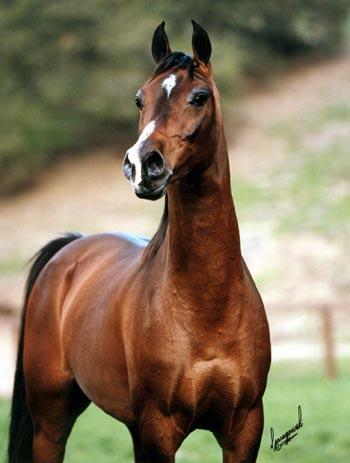 He would also make a lovely Hunter horse of Regional quality, especially for a Junior rider. Zane should finish up around 15 hands. Fall of 2005, Zane has been backed and is an eager learner, very forward and sweet. 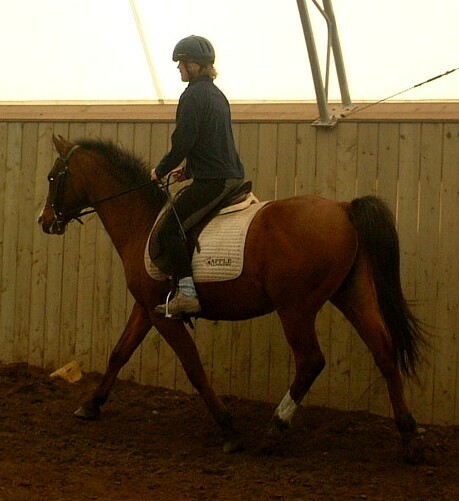 He is showing incredible elastic strides under saddle and showing the potential to be a top dressage horse. Winter/Spring 2006, Zane is being used in the lesson program for more advanced riders. 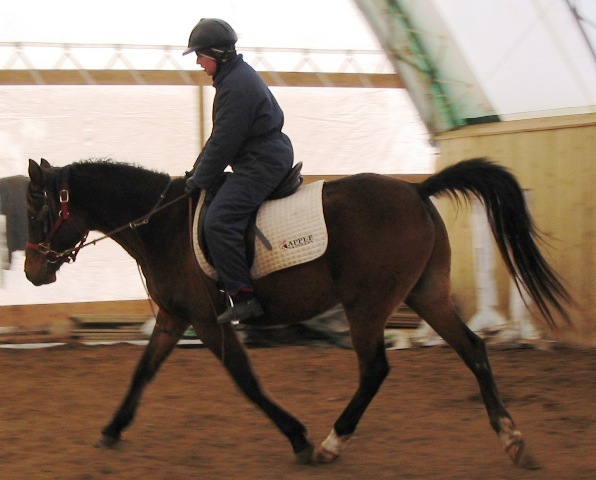 He is a whole lot of fun to ride and is solid in walk/trot/canter and well started in lateral work. Summer/Fall 2006 Zane has been to a milage ride and was a real trooper, camping out and everything with Melissa McGrath. Great pulse scores and very easy to get along with. Kris stands 15.1 hands and is a solid boy. 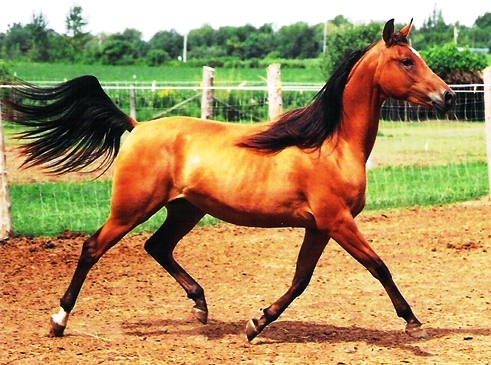 He is fancy and quite pretty with lots of Arabian charisma. 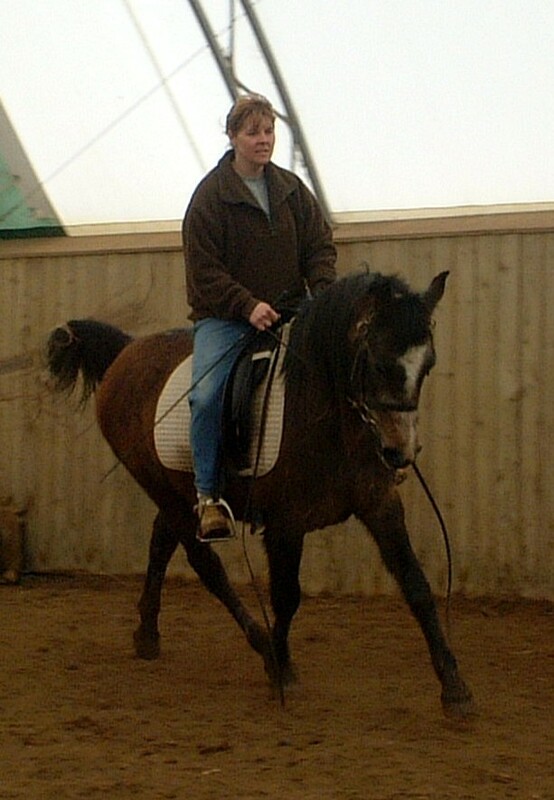 Kris has had about 9 months professional training by Karen Akins a few years ago and is well broke to ride and drive. He has mostly been lightly pleasure ridden the past couple years and needs a bit work to get him back in shape. His owner just doesn't have enough time for 2 horses. Kristian has been working giving lessons in the AES program this summer and fall. 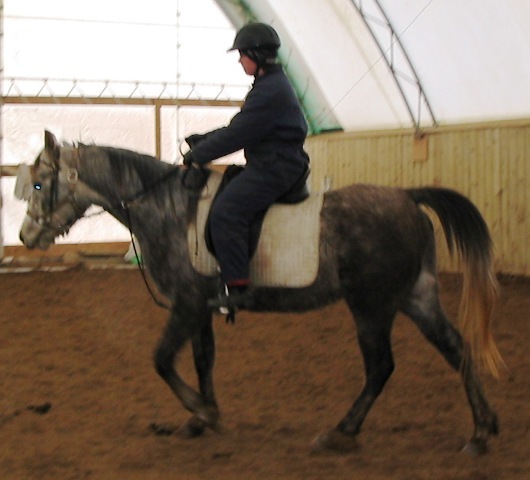 He is steady and willing, being safe for beginners in the ring and more advanced students on the trails. Czelsa is a lovely filly. She looks like she will mature a large pony, but likely will not get over 14.2 hands. 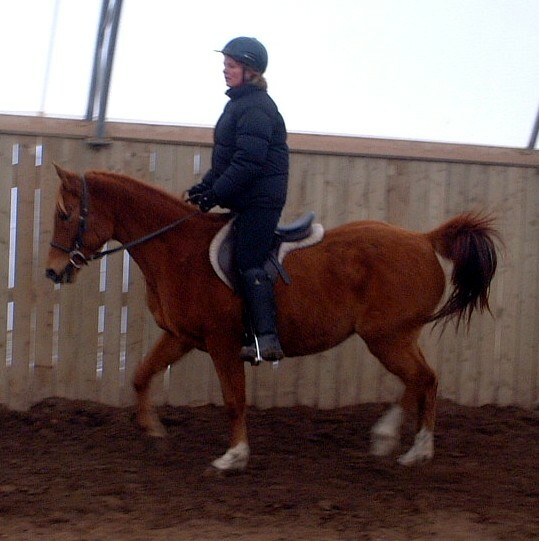 Sweet, kind and definitely in your pocket type of horse, she will start her training this winter for saddle. 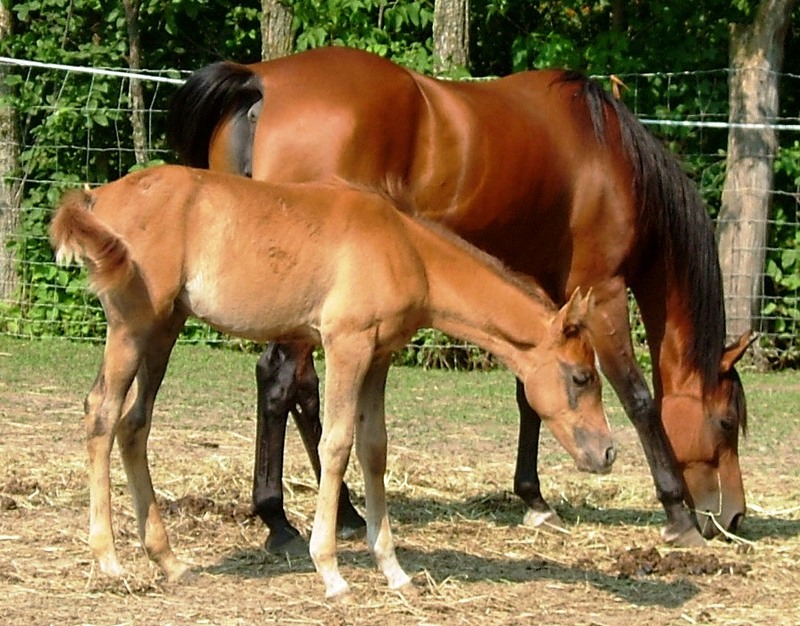 Her manners, personality and conformation will ensure her a lifetime of friends and fantastic foals. 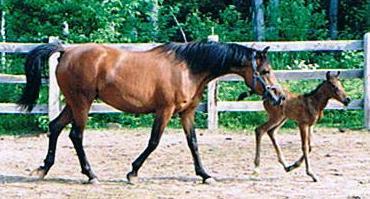 Czelsa is by the Champion Halter Stallion, Prosspector, who is by AH Gallant (Czarming Gallant's sire). His dam is by *Gondolier and out of the *Aladdinn daughter Preilude. This makes Czelsa a double *Gondolier as well as having lines to *El Paso and Gwarny. She will be very proponent and has a lot to offer a serious breeder. 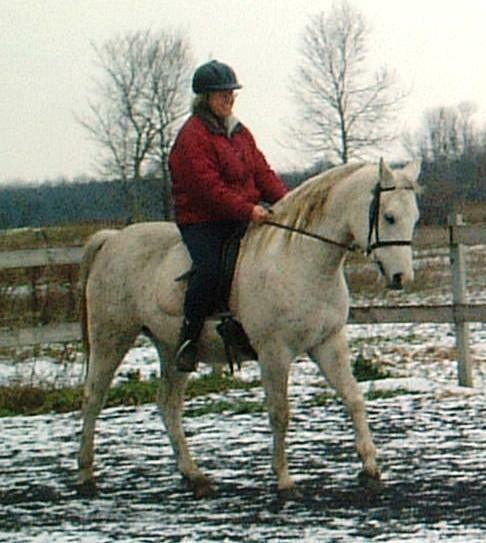 2nd time under saddle on Jan 24, 2006 - learning to bend and stretch and go forward, not to mention looking a tad bum high and on the forehand! Handsom is a lovely tall boy, at just over 15 hands and striking dark bay. He has great bone, substance and attitude. He was bred by Mary and sold as a yearling, but his owner ran out of time with her other horses and children to do much with him. He is green broke and very sound in mind and body. Handsom just needs some consistent time and miles put into him to make a great show and trail horse. 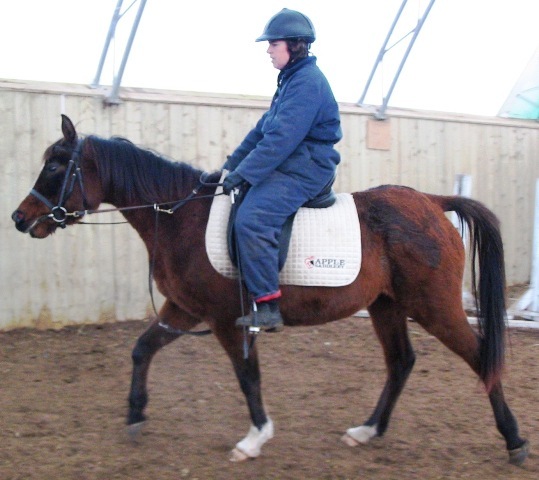 Fantastic mover for hunter pleasure or dressage. His full sister is on the East Coast doing very well as a Western Pleasure and lesson mount. 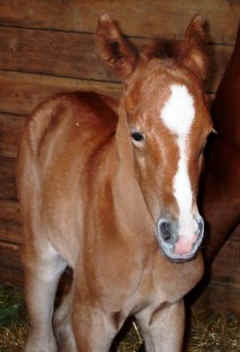 Nikki gave us a wonderful black bay colt at just over 2 weeks over due. Zip is a big strapping boy and is a lot like his big brother Thor. He will have Country or National Hunter potential. 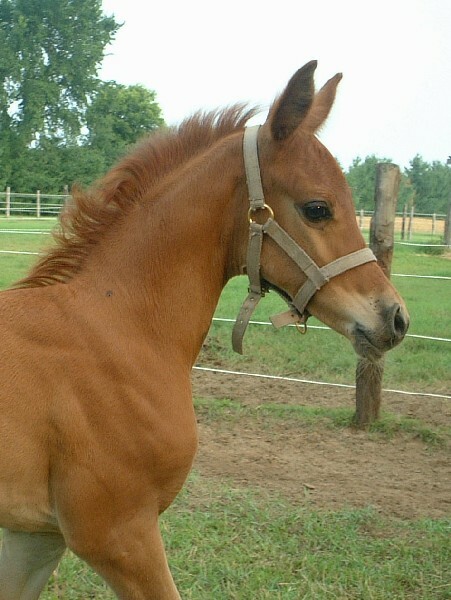 Also will make a nice halter gelding while you wait for him to grow up to ride. Should mature well over 15 hands if full siblings are any indication. Shady has come to us on an exchange and he is a very attractive young horse with loads of potential. He has a sweet expressive face, is kind and friendly. He has good legs and body to go with his lovely mind. Shady is green broke walk/trot and coming along nicely. He is not registered yet, but the paperwork is there to have it happen. Congratulation to the Lafleche Family. Shady is to be Ben's new riding horse for pleasure and CTR. He will join their other Maple Lane horses: EB Korja Dawn, EB Nakeesha, Ibn Ibn Bee and Bare Naked Ladye. 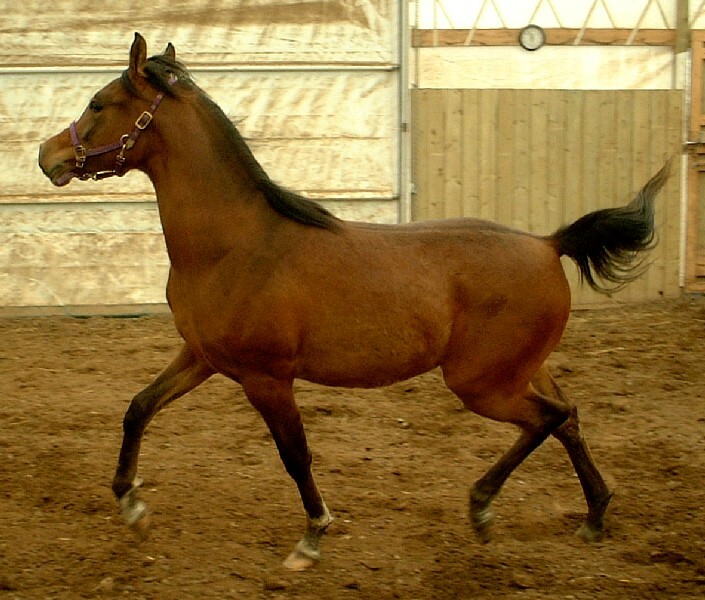 Rubi is a breathtaking mare of elegance and style. She is one of the few horses in this group to trace back to *Bask through his son Bomarc out of the champion Arax daughter, *Boltonka. 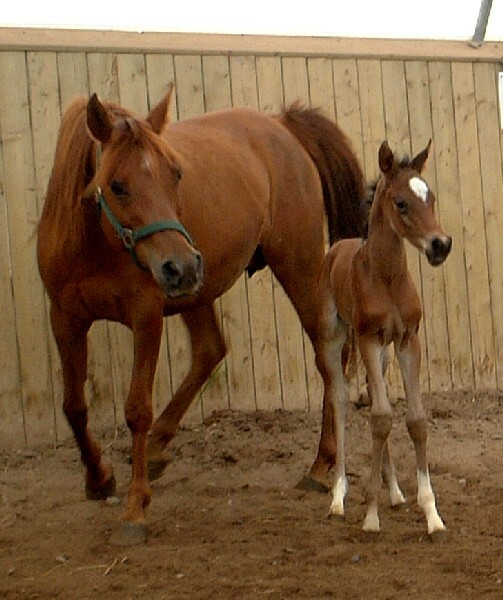 Rubi has all the qualities to be a top halter and performance mare, then pass those attributes onto her foals. Congratulations Eveline & Kerry Kipping of Willowsprings Arabians! 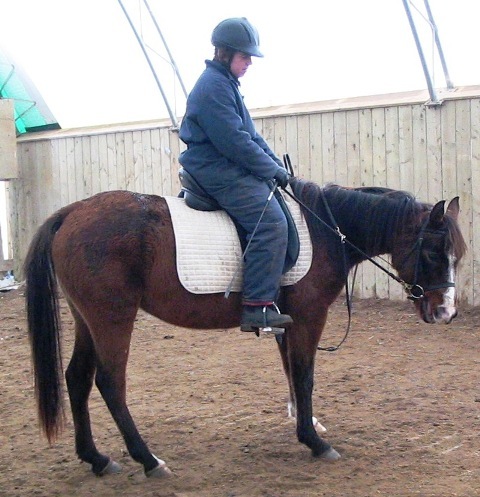 Khalida has been boarding with us for a couple years now and her owner has reluctantly offered her for sale. 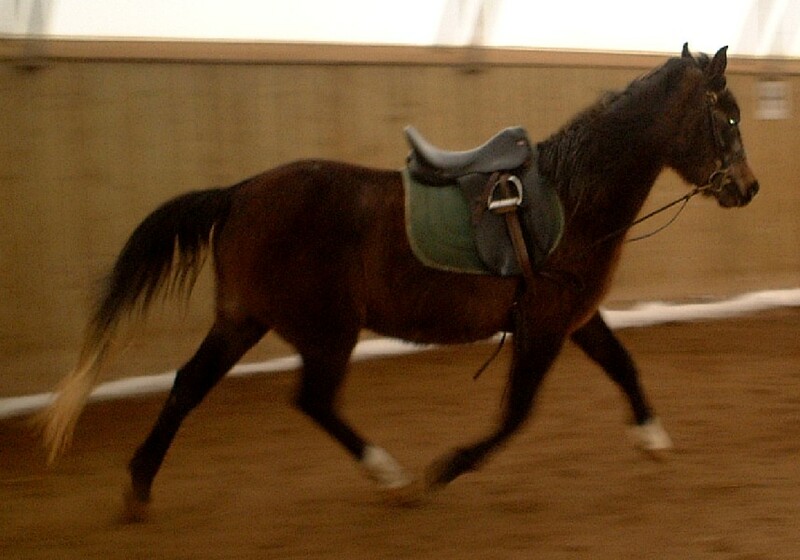 She will be started under saddle in March 2005. 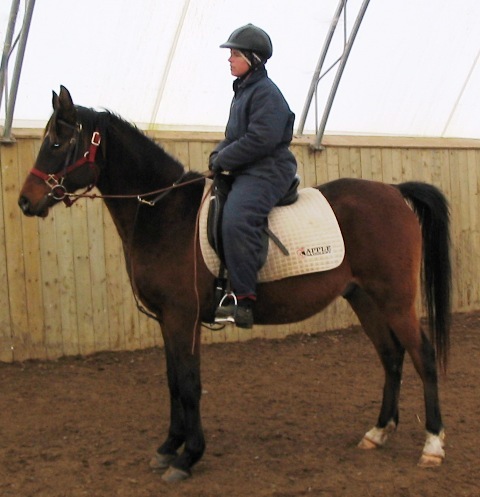 Khalida is a tall, elegant mare, standing 15.1 hands and with a pleasant expression. 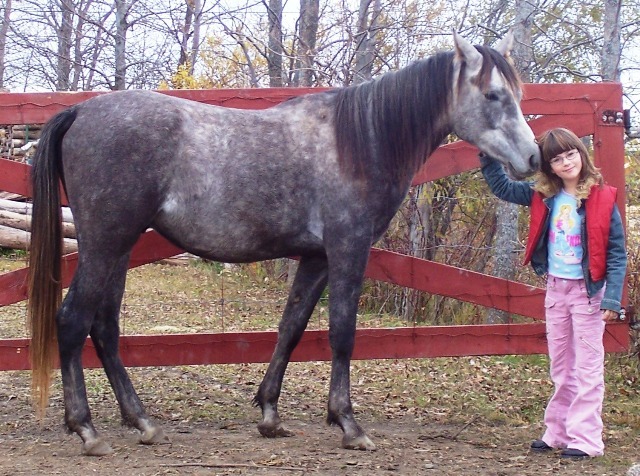 She has been used for 4-H and is easy to handle and a friendly horse. Good overall conformation, she will be a good addition to a breeding program. Her sire has done very well in dressage and her dam has shown extensively over fences. 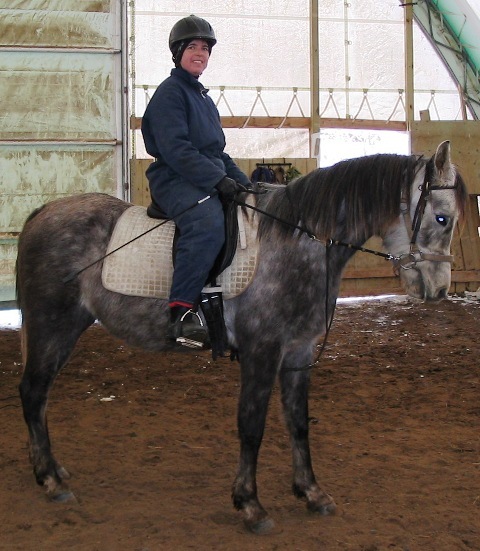 Khalida should prove to be an exceptional sport horse too. She has had one month training so far and been backed a couple times. Very calm and willing. Mecca is a beautiful filly. She is very feminine and pretty, yet has lots of substance and bone. Mecca has started her training and like a typical Hennessy kid, has taken right to it and after only 6 days of ground work she was ridden and hasn't looked back. Sweet, willing, steady, with some pizzazz that is fun, yet safe. 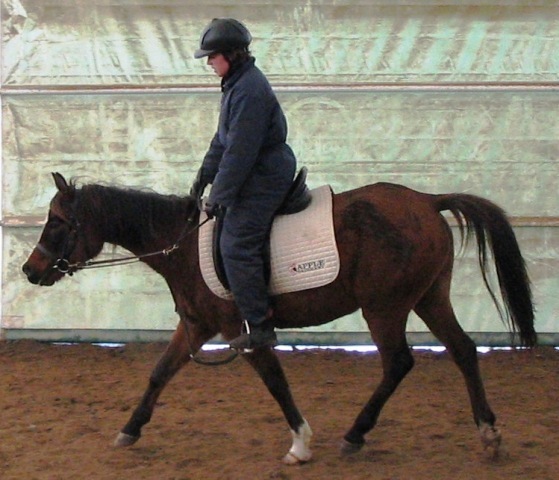 She doesn't require lunging prior to being ridden and is moving off of leg and is very responsive. She loves to lead on the trail rides, but will follow calmly as well. 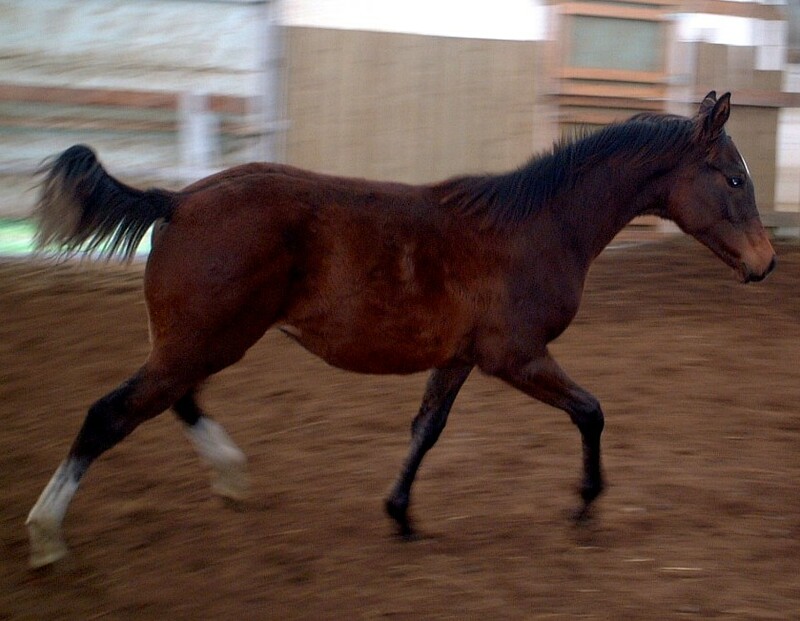 She will make a great youth or amateur's show horse, will be great in the ring or down the trails. Sensible and flashy at the same time with the most gorgeous head. Congratulations to the McGrath Family! Pixie has inherited her sire's incredible stride and presence. 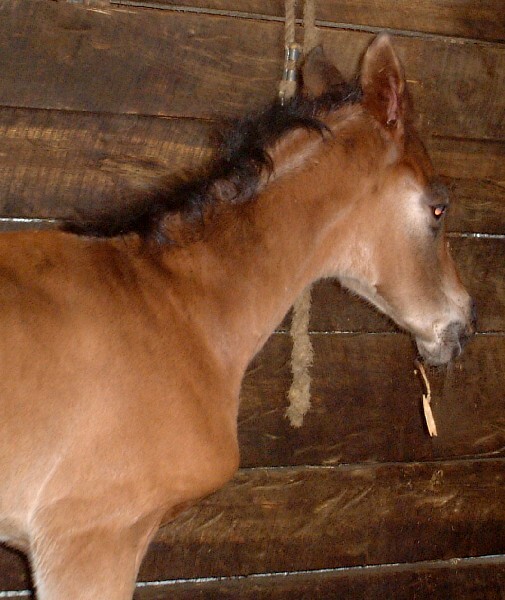 She is an exquisite filly with a lovely temperament. 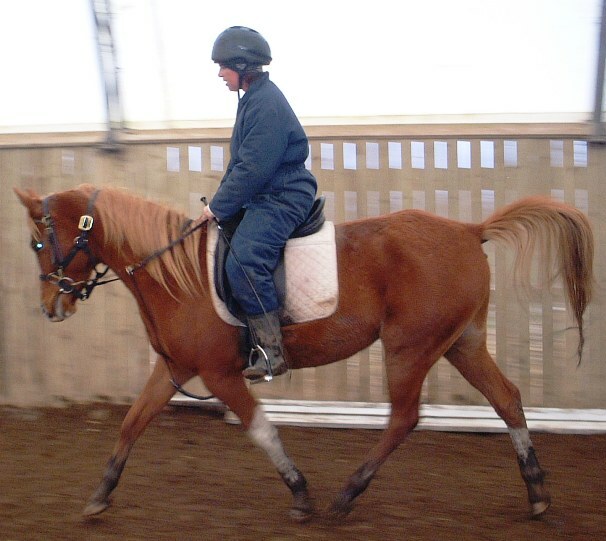 Pixie has been started under saddle and is getting solid at walk, trot and canter. She has been out on trail rides and is sensible and calm. A ten year old girl has ridden her out on the trails with no issues. 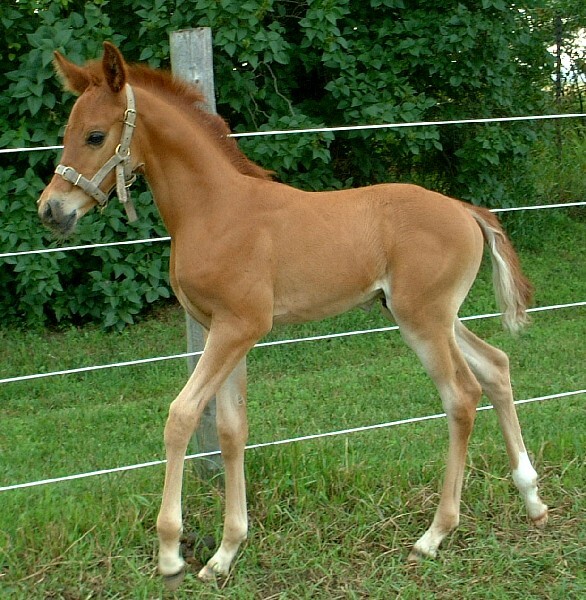 A very sweet girl, she will make an excellent JTR mount in the Hunter and Pony Dressage rings. Watch for her at the Tulip & Jubilee shows! Pixie has been successfully shown by a 10 year old in walk/trot and dressage rings. 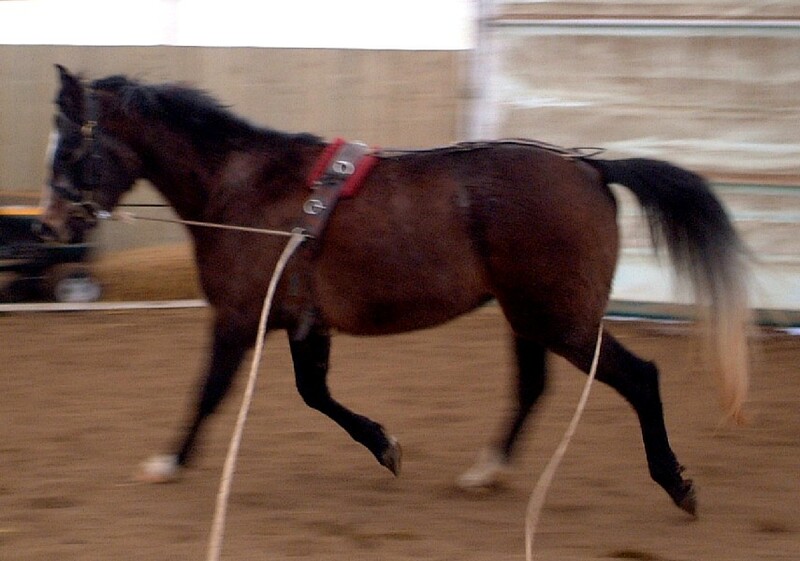 She has scored very well with high marks (7 & 8s) for natural gaits. She is currently being used for lessons and conditioned for CTRs this fall. Pixie completed 2 Competitive Trail rides, one for mileage and the 2nd with a Junior rider placing 5th with a score under 3.0. Sweet, willing and practically bomb proof! 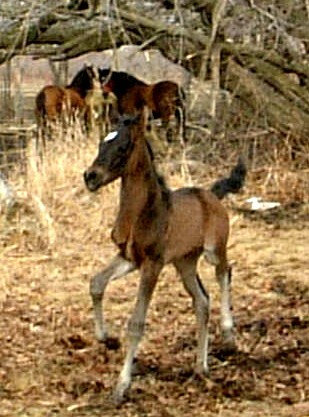 "Magic" & his dam surprised us a bit, by arriving 10 days early. We actually thought she had caught on her February breeding, so were expecting her due date to be the end of January. 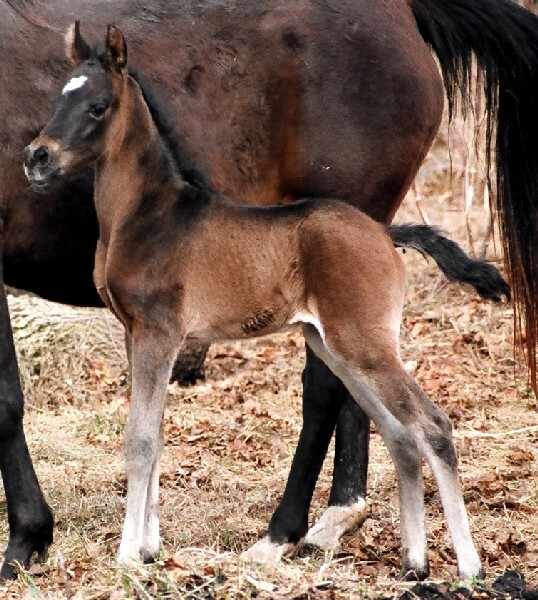 Lo and behold, she caught on her end of January breeding and delivered us a lovely black colt. He will be staying black, has 3 white socks and a star. 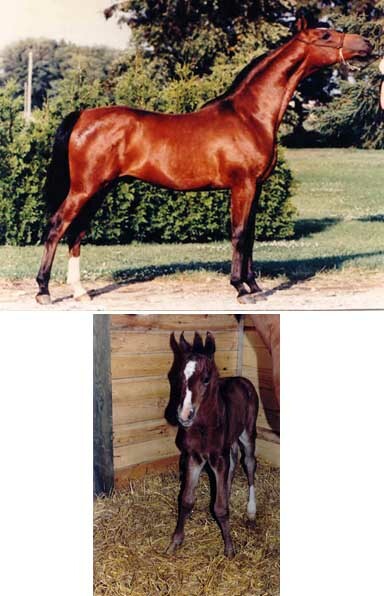 His full brother is Ibn Ibn Bee, twice named Top 6 Stallion at Eastern Canadian Breeders and most classic Arabian winner. Chanel is an incredible and reliable mare that has extensive training and has been shown in Dressage, Hunter Pleasure and Walk/Trot by a 9 year old. She was Region 18 Top 5 in Hunt Seat Equitation. Last September she completed her first Competitive Trail Ride. 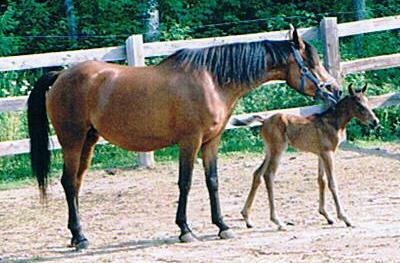 She has had 3 beautiful foals and is an exceptional broodmare. 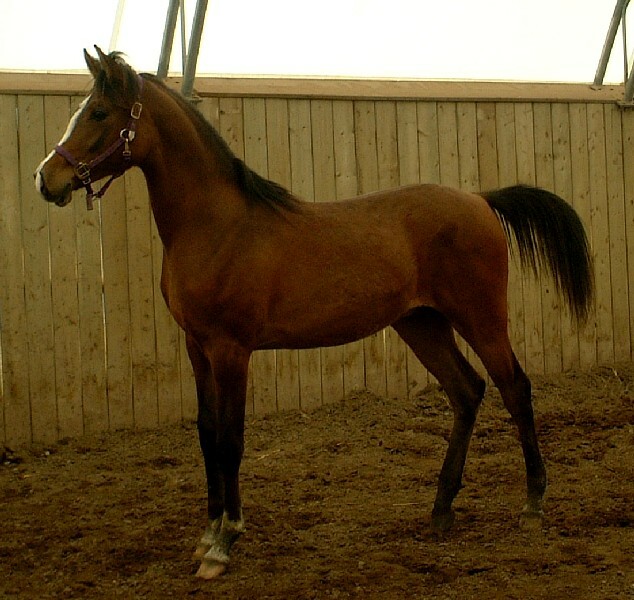 Junior just came to us and he is a sweet wonderful gelding. This year under the guidance of his previous owner, he was named Eastern Ontario Training Level Dressage Champion with scores up to 68%. 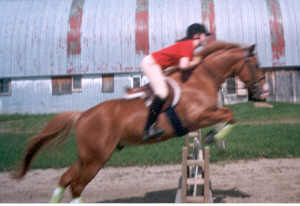 He is also started over fences, doing 2-3 feet with ease. Junior has his EC Passport and is ready to take a Junior or Amateur rider where they want to go in the Dressage or Hunter world. Naj is another gelding that just joined us on the farm. He arrived on a Friday, gave a lesson to a beginner then went to a fun show on the Saturday with the "kids". He looked out for everyone and did very well with all the riders who were introduced to him for the first time! In fact he was 1st, 2nd & 3rd with 3 different riders in the obstacle class. 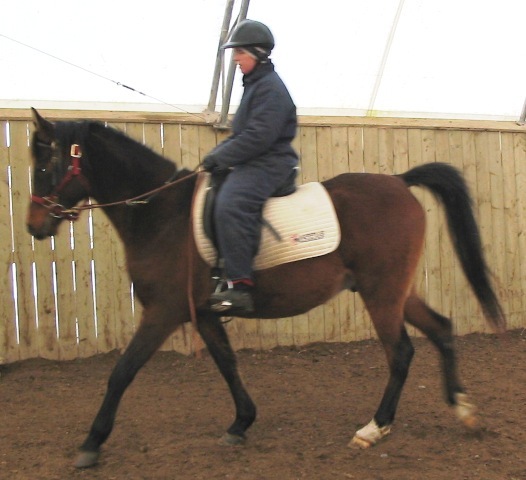 A very sweet and willing horse, he has excellent movement and is very suitable for a Junior or Amateur rider in many divisions, including over fences. Sahra is a spectacular mare. She has size, substance, type and quality written all over her. She has had limited showing at the local level and has done very well in Hunter Pleasure, Western Pleasure and Show Hack. 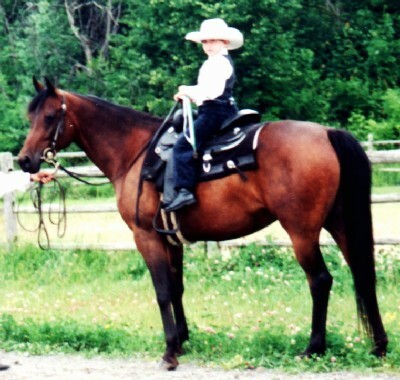 As a 4 year old she won her first two Competitive Trail Rides in the Novice Division with a Junior rider. 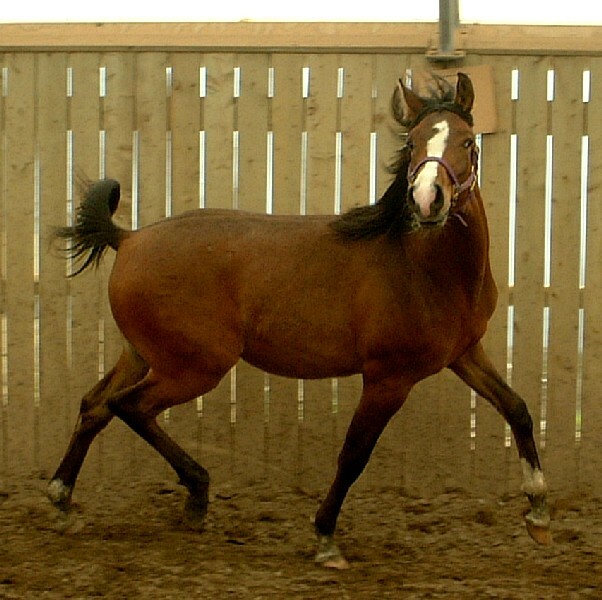 This is a mare that can do it all and has the quality to be a top show horse. $4500.00 Firm. Approved home only. 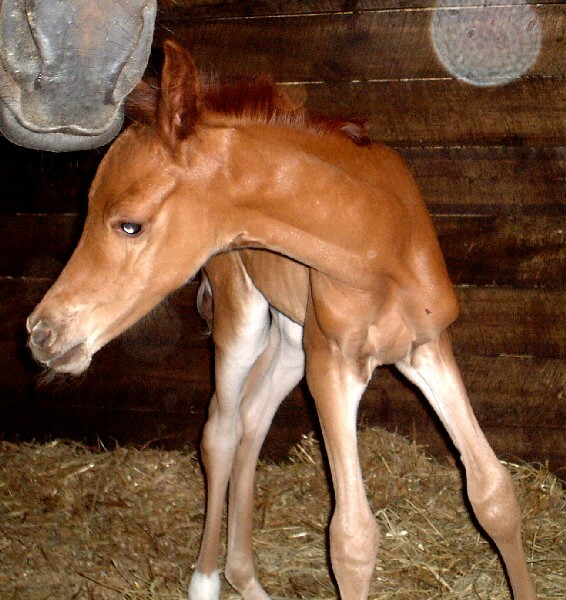 Star arrived at 10:30 pm, making him an April Fool arrival! 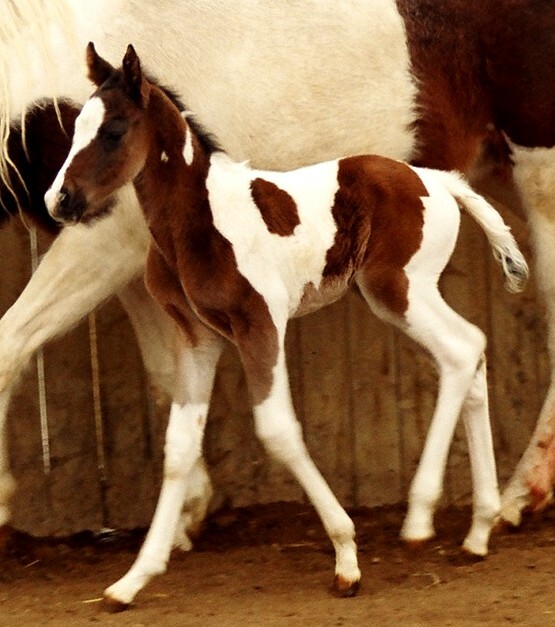 Tall, leggy and very friendly, Mary says he is one of the smartest babies she has seen. Very coordinated and strong right from the start. 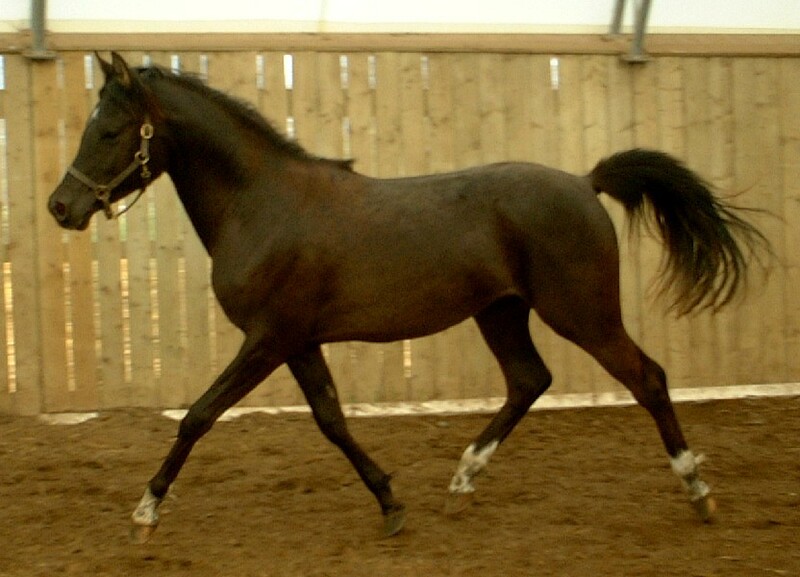 Solid Bay with two matching hind stockings and a star, he is very striking and has superb movement. 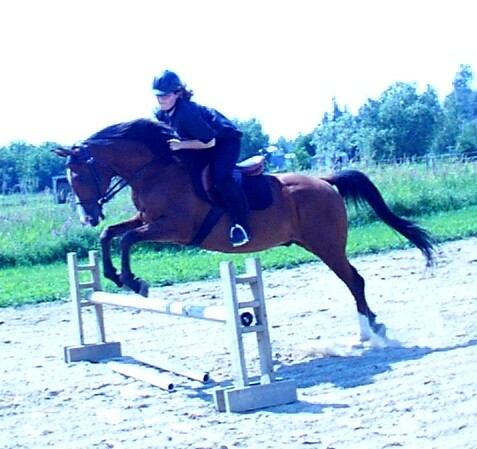 He will make an excellent Hunter Pleasure, Sport Horse, Dressage prospect, not to mention Competitive Trail. Every so often a youth applies to us to "work" for a horse. They have to be committed, determined and in the for long haul to get all their hours in before "earning" their horse. It is with great happiness that we have agreed to let Marianne Moore work for Star. Now owned by Shanna Govang. Canbee is our second of this cross. 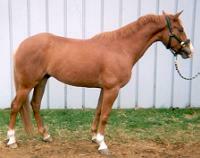 His full sister sold to an eventing home and is well over 15 hands as a yearling. This cross is everything we hoped for, the ultimate in a Sport Horse. 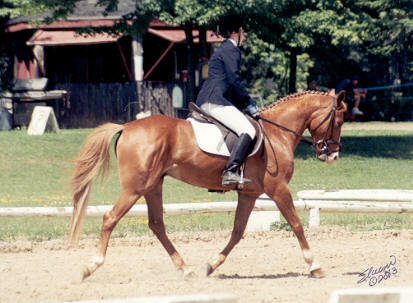 Shown at the Jubilee, Canbee was named Reserve Champion HA gelding and won his class. $3000.00. 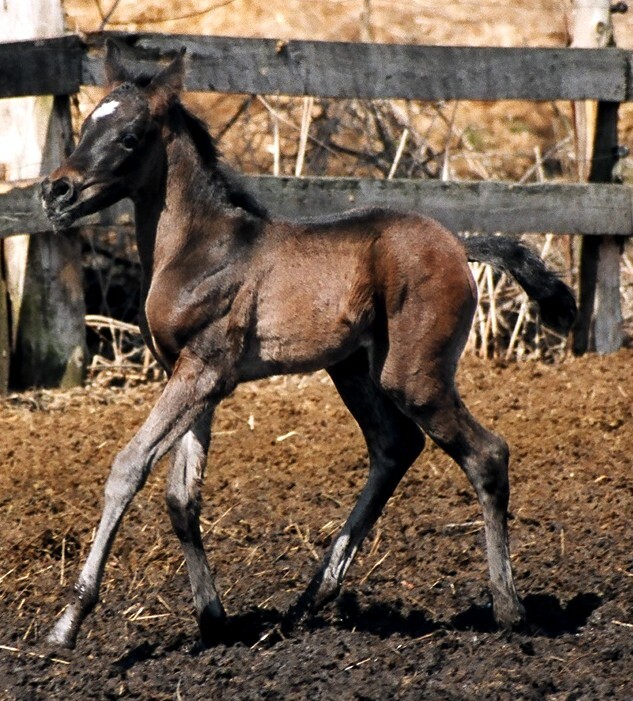 China is the the flashiest of the 2002 foal crop. With her minimal markings of matching bowties and discreet socks, she is just lovely. Personality to go with all her looks, she is charming and friendly. 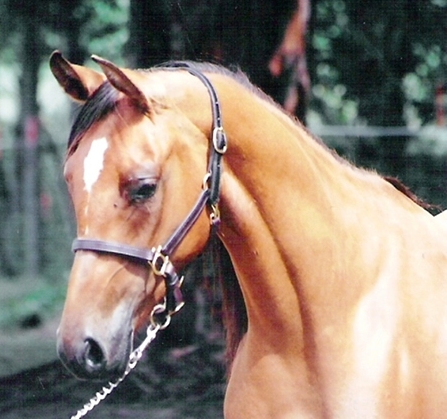 Definite show quality, she will excel in the Arabian or Open show rings. $3000.00. 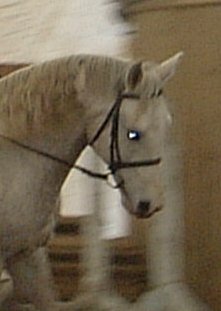 Smokey is a lovely boy with intriguing light blue eyes. Tall, refined, athletic and friendly - he is a great companion with the potential to take you anywhere. $3000.00. Congratulations Al & Megan Wilson. 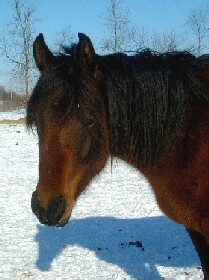 Dare is a lovely, sweet and willing mare. She was lightly shown by several youth in 2002 as well as completing her first CTR. $4000.00. 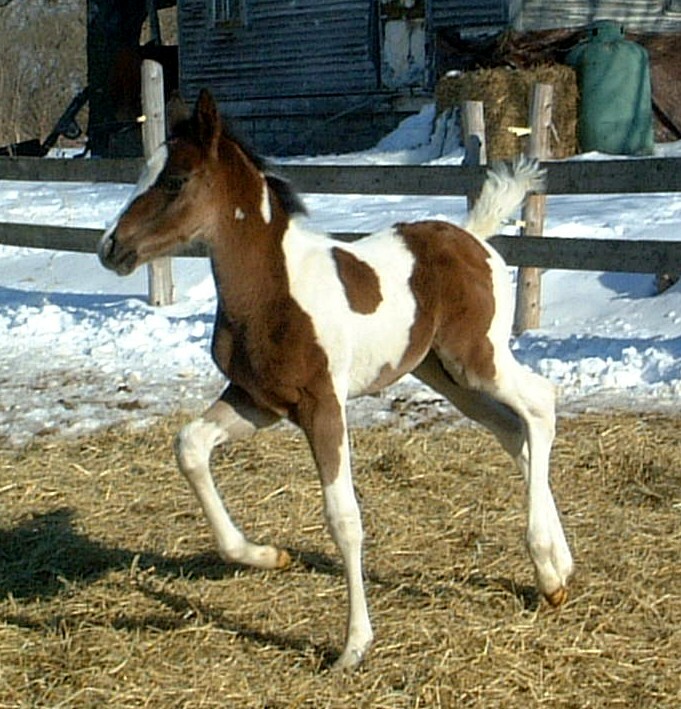 Scout with his fantastic markings and even better movement is destined to be a superstar in the HA division. $3000.00. 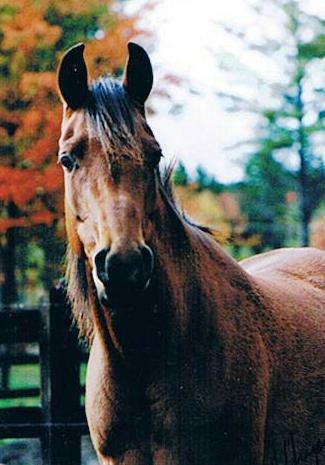 Ibn was shown Halter and Most Classic, being undefeated in Most Classic and Eastern Canadian Breeder's Top 6 Stallion twice. 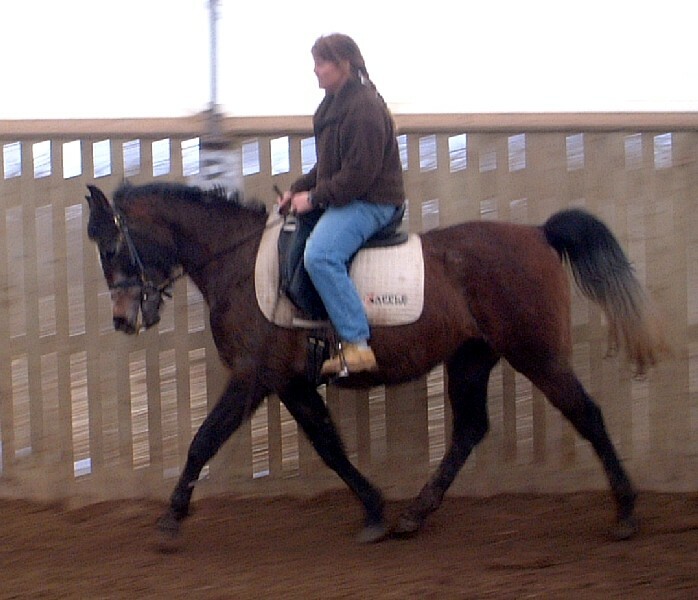 He was a lovely boy to start under saddle. $5000.00. Classic pedigree and looks, this boy is special and knows it. Sold as a weanling he did attend one show as a yearling and was named Junior Champion Gelding at the Tulip. $3000.00. Congratulations Megan & Al Wilson. 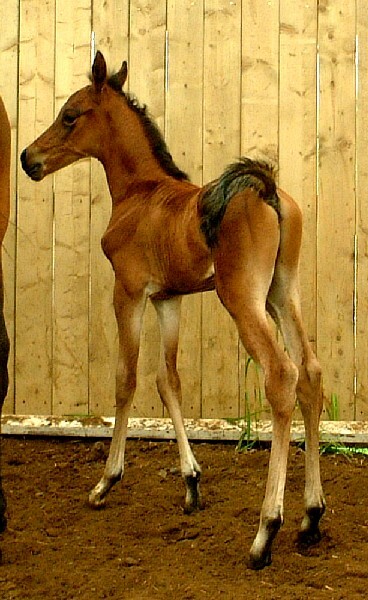 A sweet mare, great body and legs. She sold to Bob Jamieson, who then gave her to his daughter as a wedding gift! Lucky gal.